Welcome back to Day 28 of Freedom from Clutter in 40 Days. We are really cruising through the decluttering now! If you are tired of the burden of clutter in your home then this series is for you. Day by day we are getting rid of the items that weigh us down, slow us down, and get in the way of having time to spend with our families. Decluttering sentimental items is so much harder than tossing out broken kitchen tools. Decluttering sentimental items stirs up all sorts of emotions – both good and not so good. I love to watch my children grow up and I celebrate each milestone with them, but sometimes………..I mourn for the little babies they once were. Don’t worry. I don’t need therapy. I think it’s quite normal and because of these conflicted feelings, I have had a hard time letting go of some of the items in my home. I keep reminding myself over and over during this decluttering journey that people matter and stuff doesn’t. If I have a home that is full of clutter, there isn’t enough space for the people I love to enter………..both literally and figuratively. I no longer want to live in fear of friends and family showing up unannounced. I’m tired of making excuses for “the mess.” I want to provide a home that my children can be proud of when they invite their friends over. I’m ready to move on. Life is full of ups and downs and changes. It’s time to get rid of some of the past so that I can make room for the future. As you declutter your sentimental items keep in mind that this is going to be a much slower process. There is much less just throwing things away. Each item will likely bring a flood of memories. Make sure you are in the right frame of mind to get started or wait till you are ready. Right after your kid leaves for college or after the loss of a loved one is probably not the right time to declutter sentimental items. Too many tears and too many emotions to make good decisions. When you are ready to declutter sentimental items, pick a small area to work on. Pick up each item and give it some thought. Do you truly love this item or is there some other reason you are holding on to it? My first thought when decluttering items belonging to or created by my children was to declutter without them. Later, I discovered that it actually helps to have the kids around if possible. It is amazing to me that I was holding on to so many things for them only to find out that they could care less about them. It felt good to “have their permission” to toss some items. It was a confirmation that I was making the right decision. It’s ok to keep some sentimental items. Keep a box of items or maybe even find some way to showcase your sentimental items. I love the idea of the t-shirt blankets and repurposing some items into artwork. I love to make scrapbooks with pictures and memorabilia. I then can throw away the rest because my memories are preserved in those books. What I don’t have room for in my house is every paper my kids ever brought home from school and I don’t have room for trinkets that my children don’t care about. 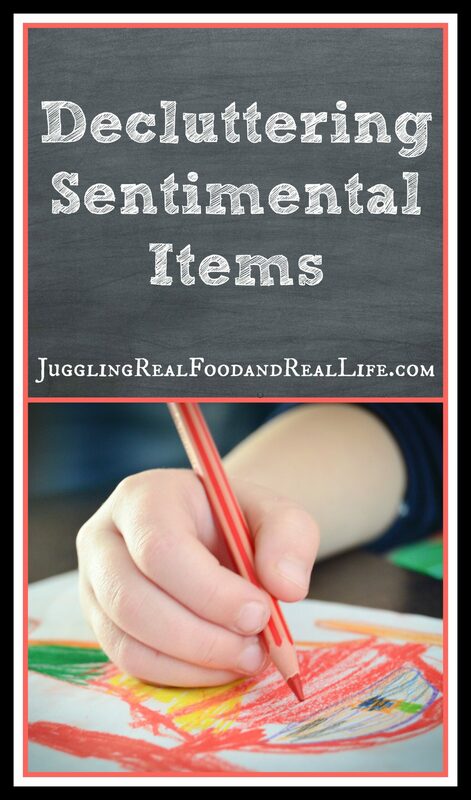 Take your time and see what sentimental items you can declutter from your home. Are there items that you find especially difficult to part with? Leave me a comment and let me know how you are able to declutter sentimental items. How does it feel when you remove these items from your home? Big projects like this are always easier when you have friends to help you so I look forward to hearing from you. Want more? Click on the image below to continue reading Freedom From Clutter in 40 Days. I love to declutter! I just don’t do it often enough but when I do, I feel such freedom! I also like the idea of repurposing old and sentimental things (like t-shirts). I have yet to make a blanket, but I have plans to. I finally decided to buy medium-sized plastic storage boxes and designate one for each of my 4 kids. I add to it every so often. This holds pictures, drawings, and other things I think they would enjoy looking through when they get older. Declutter of sentimental things can be so emotional exhausting! I am a big fan of taking pictures of things and then getting rid of the actual items. Have you ever thought about making a memory book of these items? Shutterfly and other companies make beautiful books. With anything, keep what you like and have room for. I have a few items from my grandmother that I would never get rid of, but I was very careful to choose items that I have room for. My house is full of my loved ones memories at Christmas because I have so many of their décor items. After the holiday, I put them back into storage.